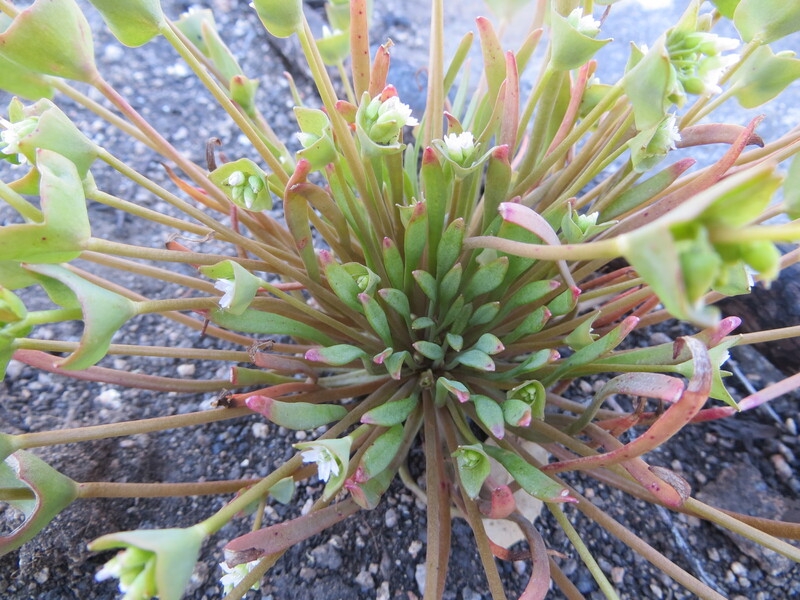 Remember the above, beautiful plants photographed flowering a little over two weeks ago in Nevada? 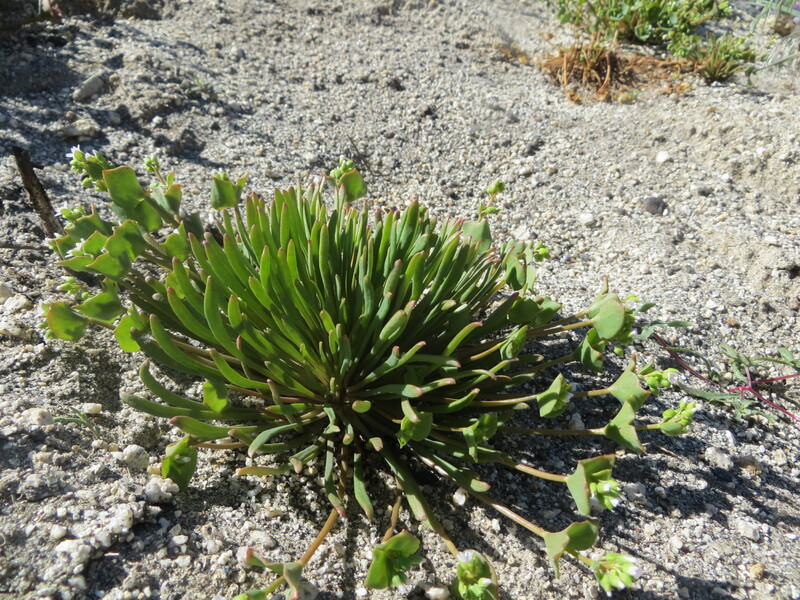 If not, see my previous blog post, ¡Holy frijoles! 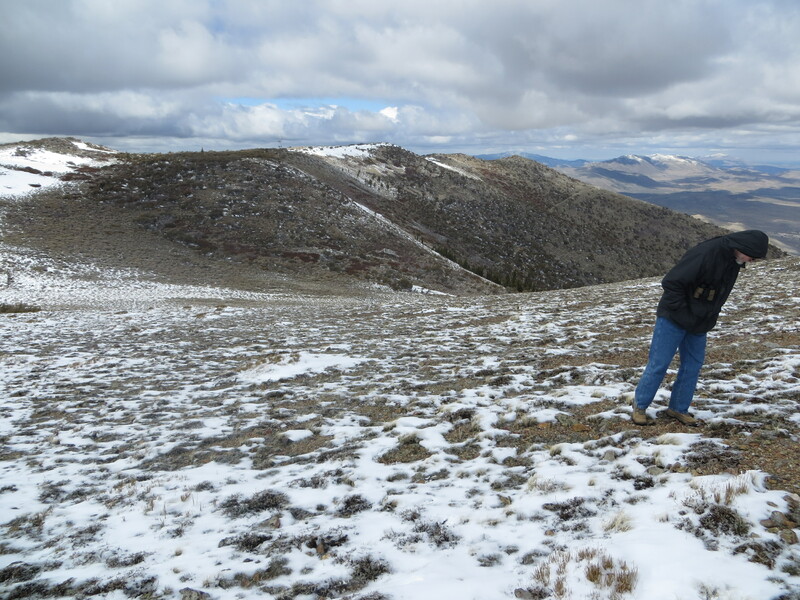 Dr. Jeff Doyle (Cornell University) trying to stay warm while searching for the elusive flowering Claytonia. 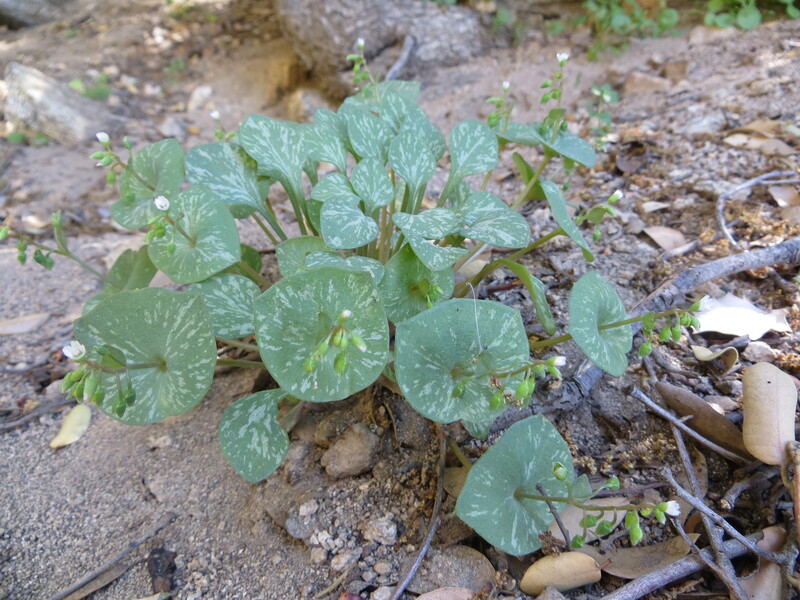 Above is a picture of a location where I collected another population of Claytonia umbellata in the Pine Nut Mountains at Minnehaha Canyon on my spring break trip nearly two weeks ago — the talus I know and love, seemingly characteristic of the Desert Southwest Claytonia. 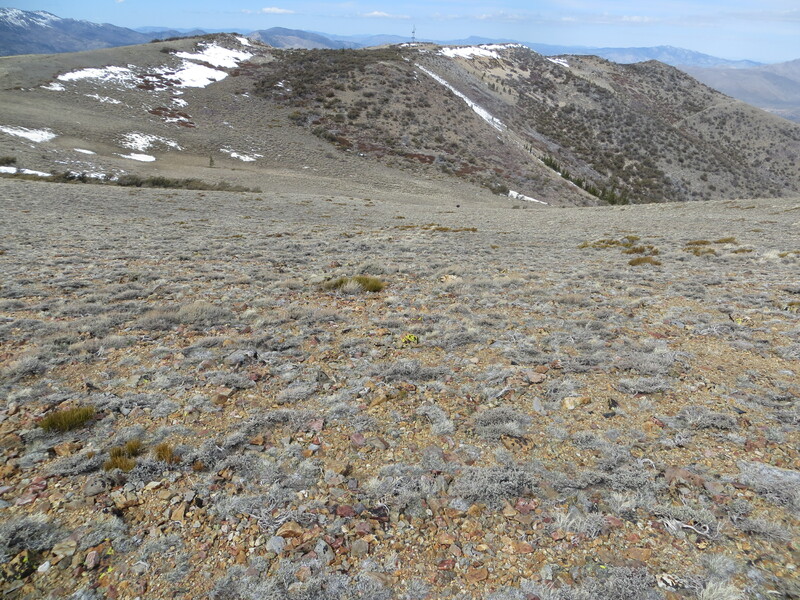 Bearing that in mind, when I see a habitat like the one above, or the one pictured below, and I am very near the type locality of Claytonia umbellata in the area of Mt. 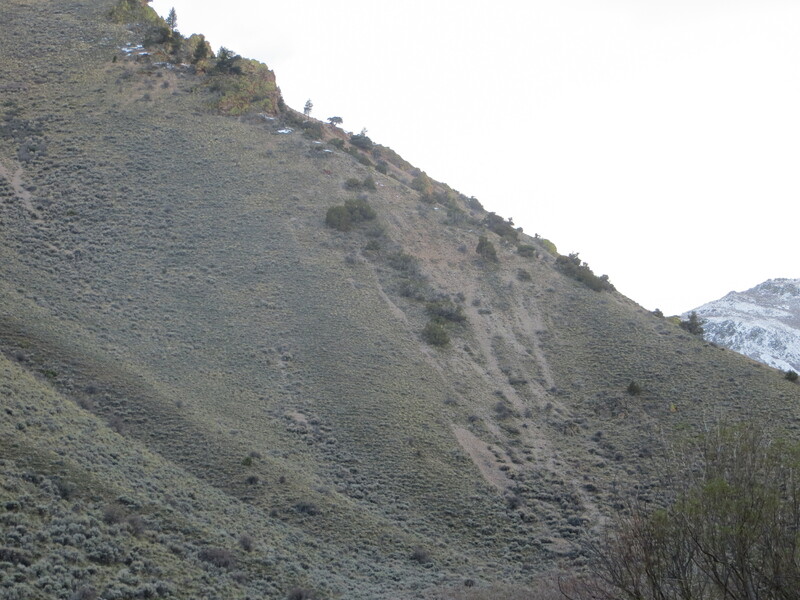 Davidson Pass (Nevada), I have to stop and take a look, right? WRONG! 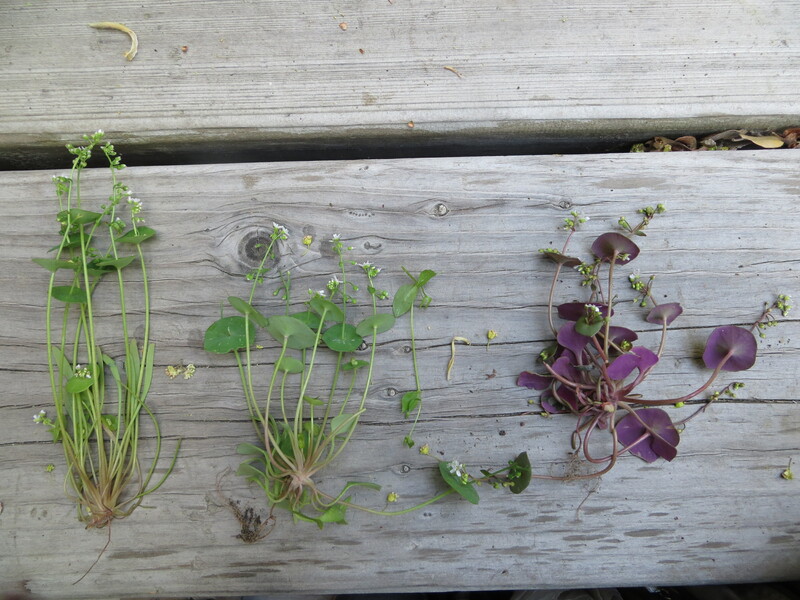 There aren’t any Claytonia there (above), not even a C. rubra or C. parviflora ssp. viridis to cheer me up for making a bad call — Nothing! 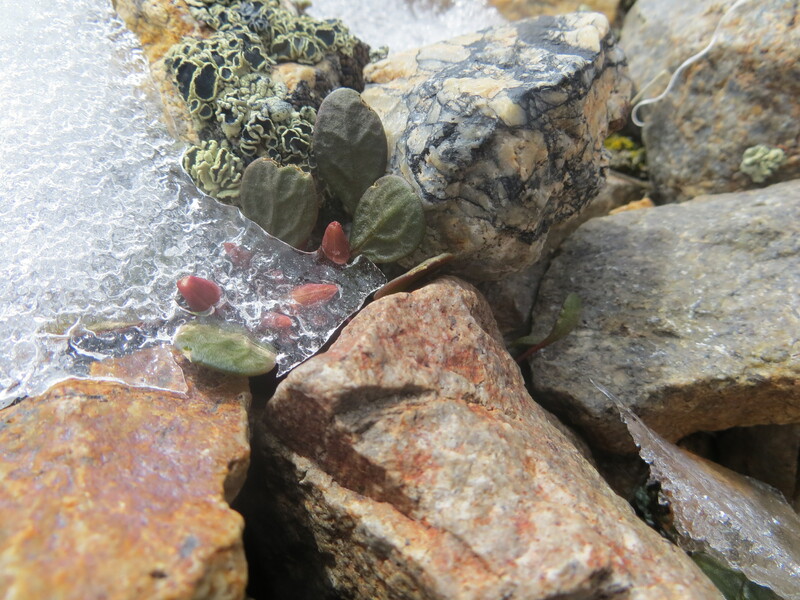 But it looks so good, and the rocks are the same as at Minnehaha Canyon… sample size of one strikes again with these guys. Ever heard the phrase, to each his own? 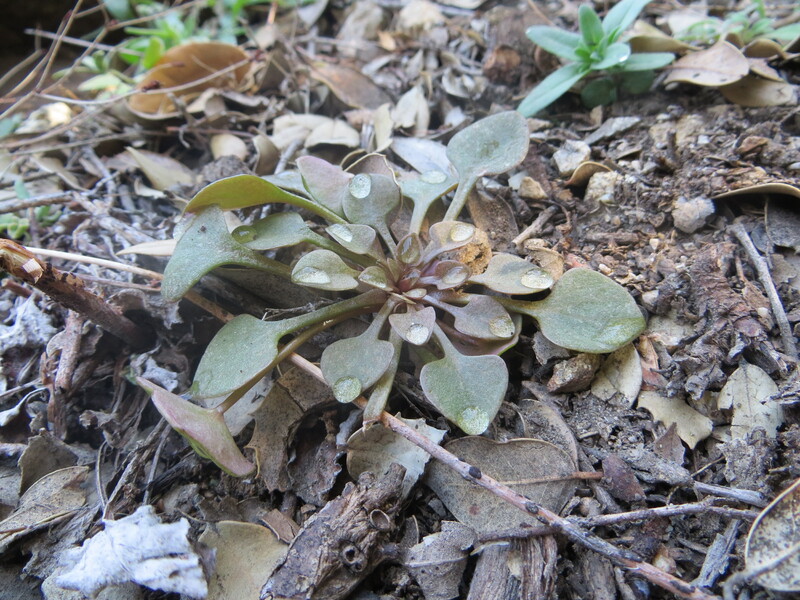 Well, I’m beginning to think these Claytonia take that to the extreme. 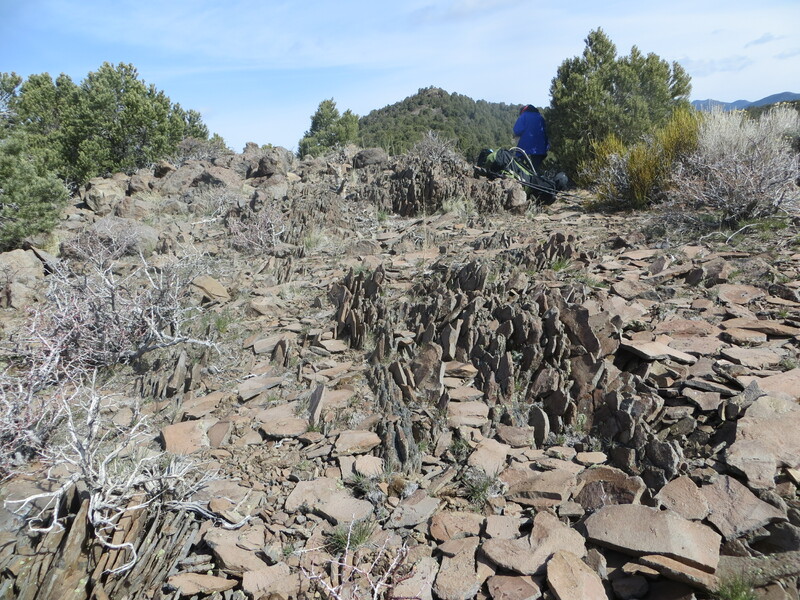 They are not very good at getting around (dispersal), or they have very picky palettes… or both. 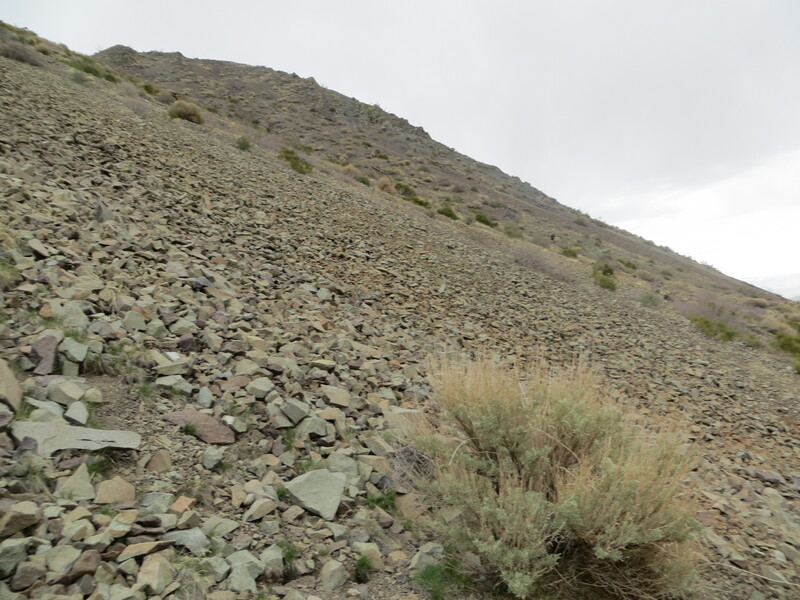 Pictured above, a talus slope of volcanic rocks in the Pah Rah Range near Pyramid Lake, Nevada. Oh no! The sun will be setting in a few hours! 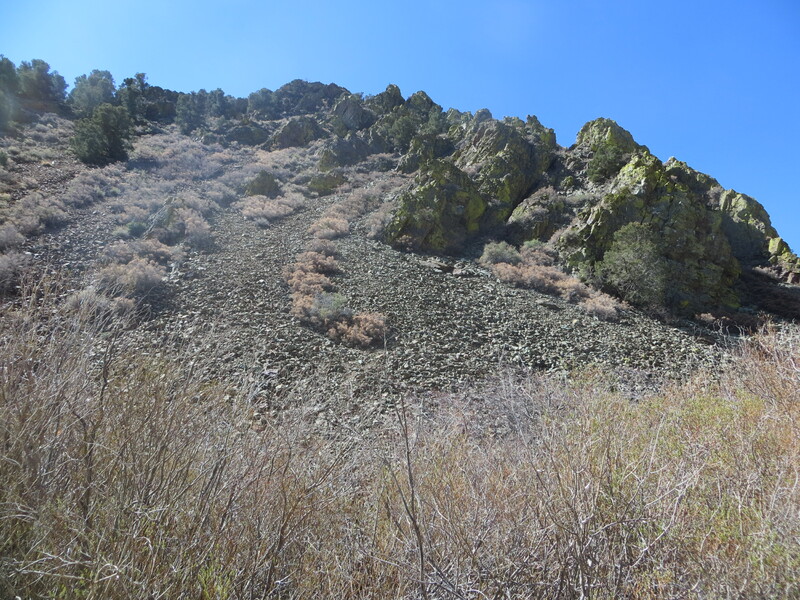 We can try to climb that slide and run the risk of not finding any plants, or we can try to race up the canyon to get to a known locality before dark sets in… Jeff and Jane agree, it’ll be worth giving this hillside a good look over before we continue up the canyon. 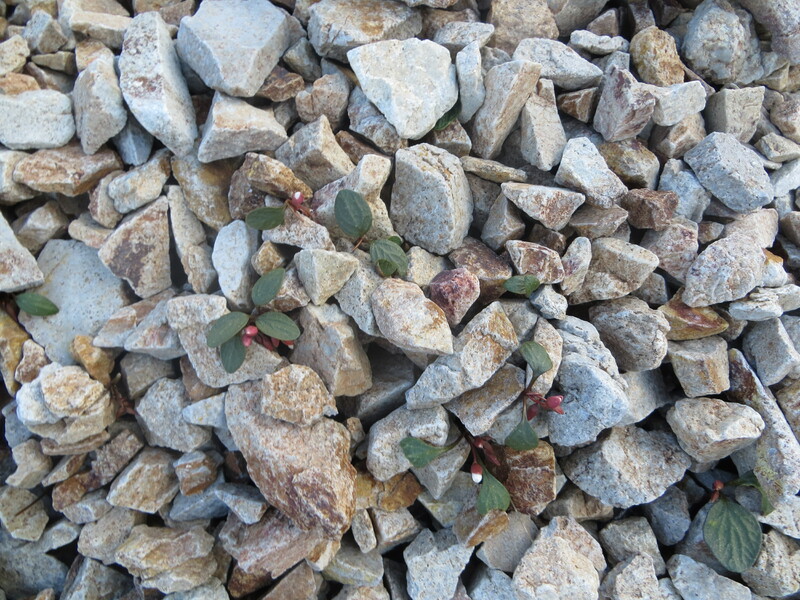 And thank goodness we did — this area of talus was rich with numerous plants of Claytonia umbellata! 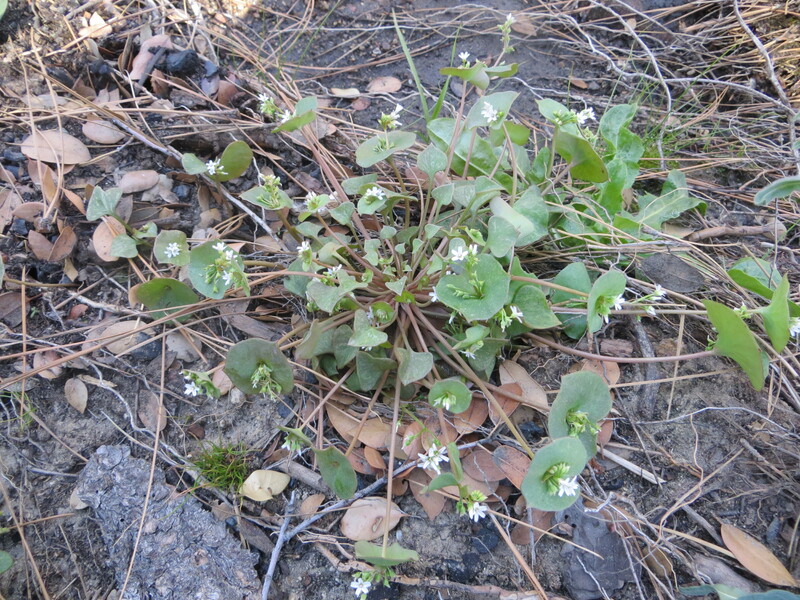 We found a new locality for Claytonia umbellata, approximately one mile away from another known locality in the Pah Rah Range AND it was the large-leaved plants, like those seen in the Pine Nut Mountains at Minnehaha Canyon. 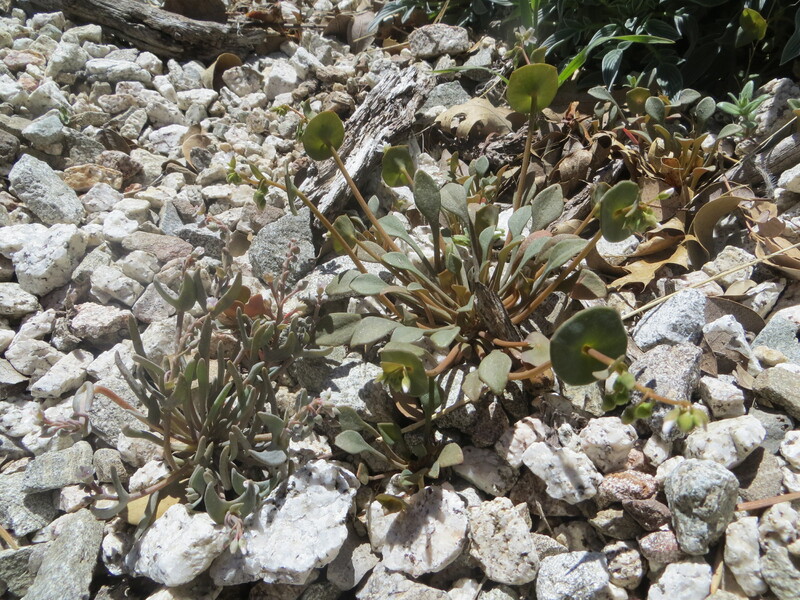 Compare those to the plants from Peavine Peak (top of page), which happen to grow on different volcanic rocks! Déjà vu — a feeling of having already experienced the present situation, independent of whether you have or have not experienced the situation or something like it… No idea what I’m talking about? 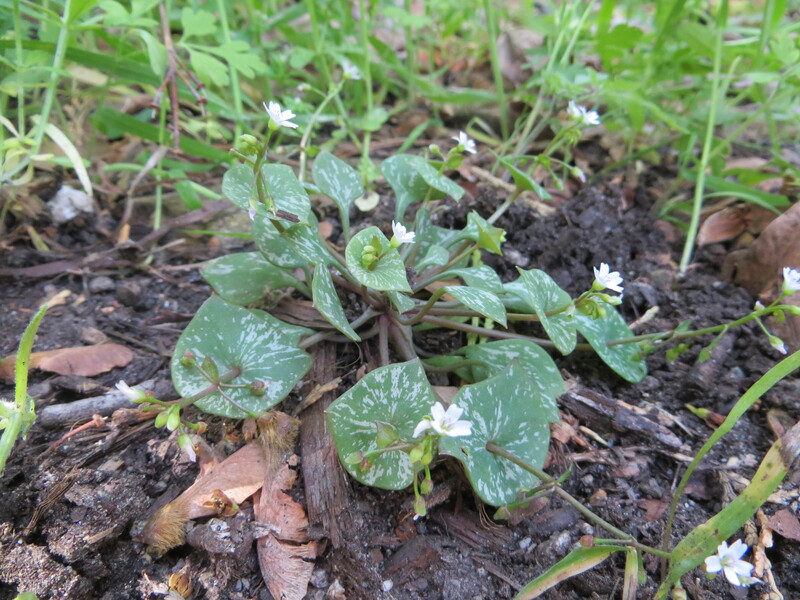 See my “Claytonia rocks!”post — click here for more background information. 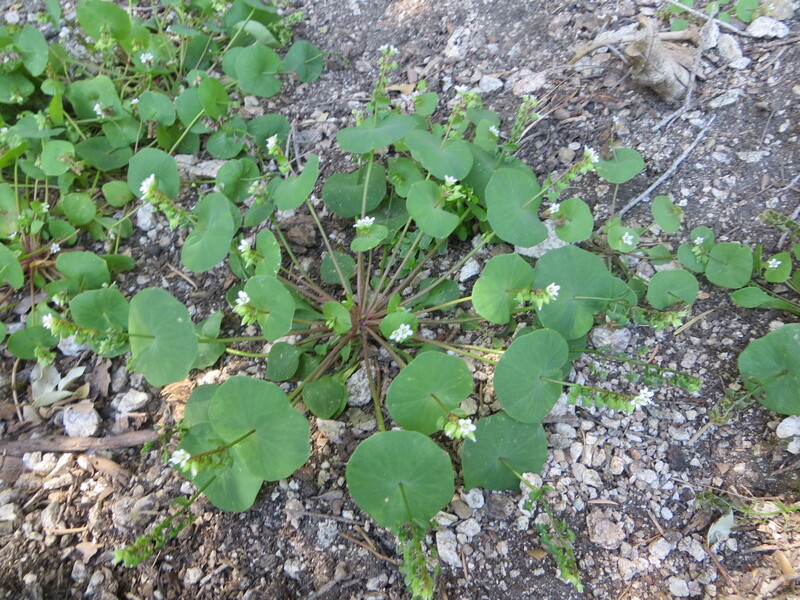 I still was unable, though, to fulfill my promise to Jeff and Jane Doyle — we had not yet found flowering Claytonia. 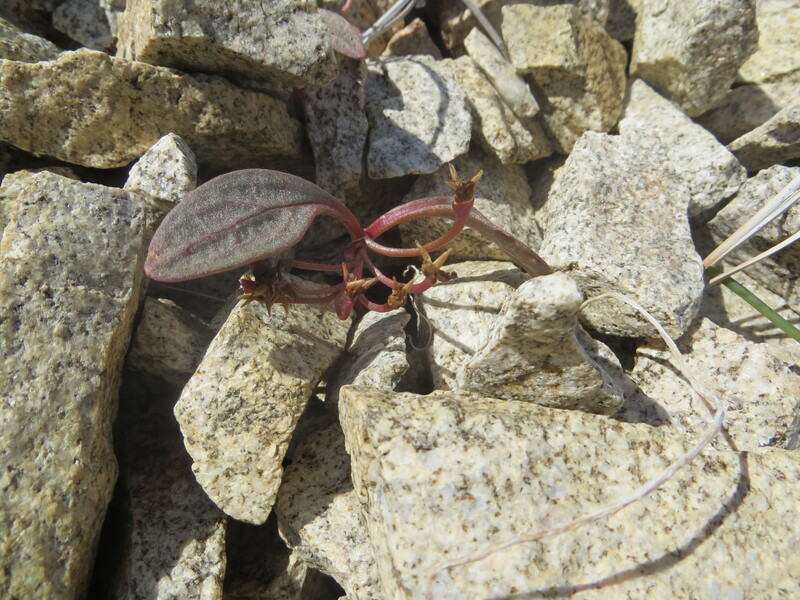 There was one more chance to find flowering plants while in Nevada looking for Claytonia umbellata.This was a revisit for me, to a site in the Pine Nut Mountains where I was unable to locate a population on my previous visit. 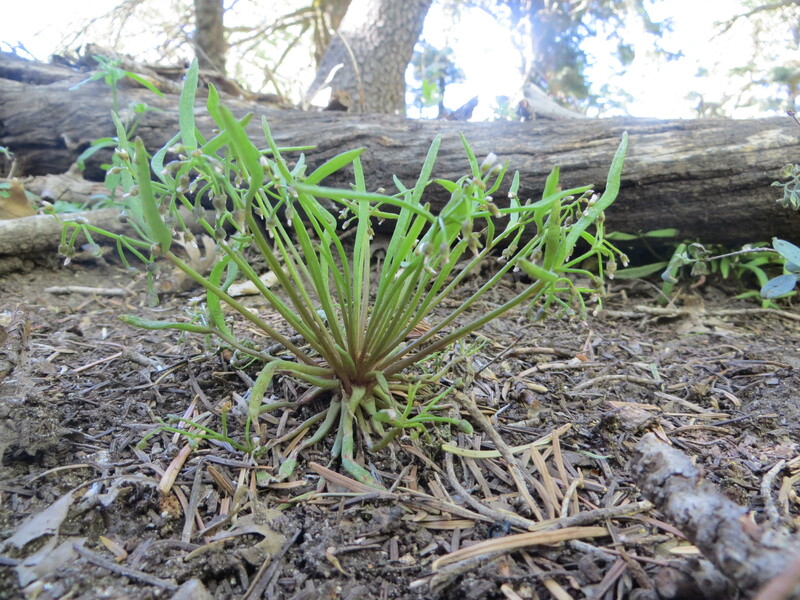 This population is near Bismark Peak, and as far as I can tell, it has not been documented by any herbarium specimen. 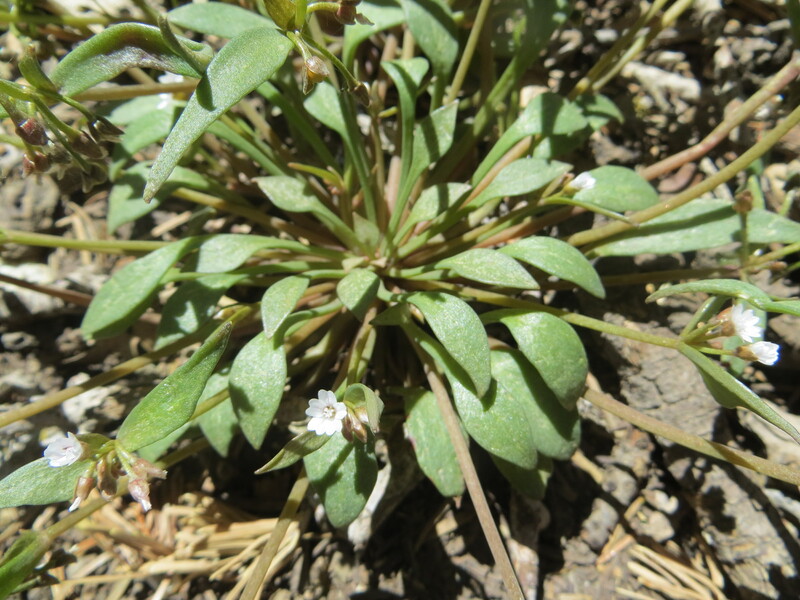 I found out about the population by scouting CalPhotos for pictures of Claytonia — this population had been photo documented but never vouchered. 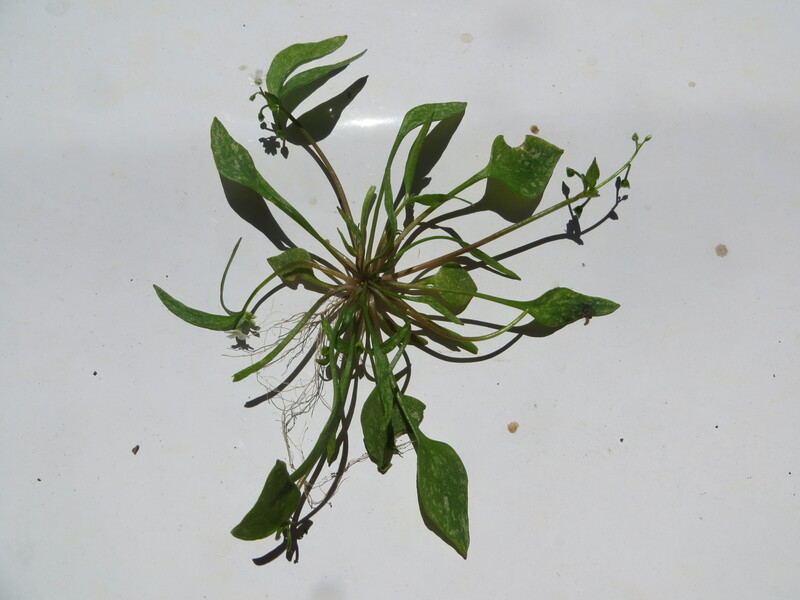 I want to give a shout out to Larry Crawford, for giving me enough information to find some plants! 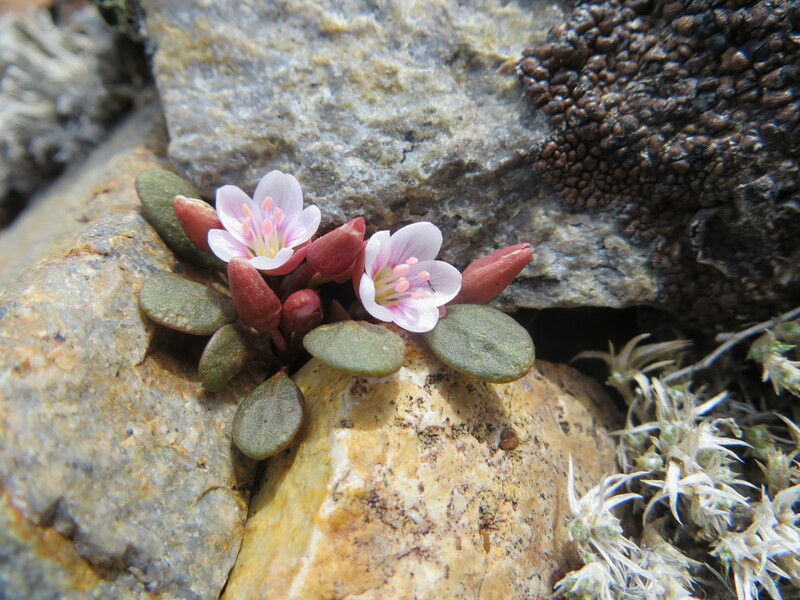 I was not able to relocate Larry’s ‘secret patch’ of Claytonia umbellata atop Bismark Peak, but the Doyles and I were able to find a new population along the same ridgeline! 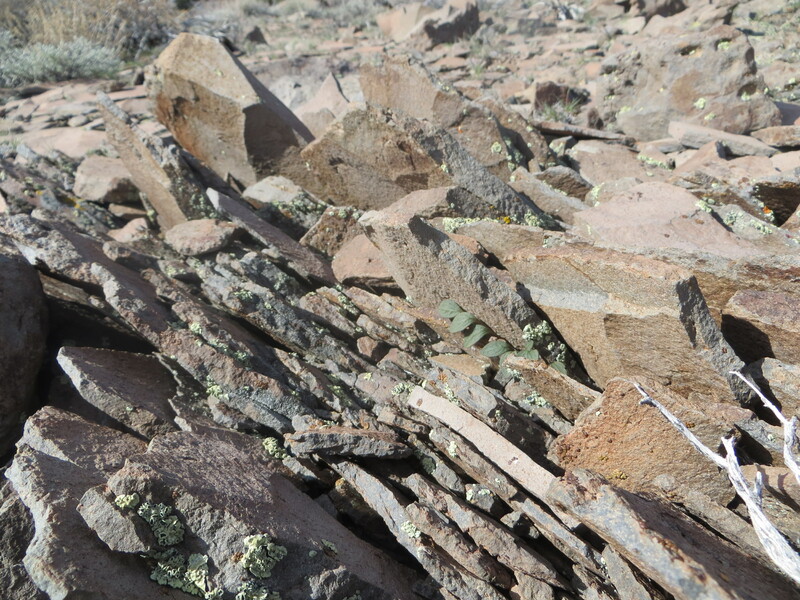 Believe it or not, and I’m sure to Larry’s delight, the plants here occur in a really unique habitat — I’m still working on the rock identification (volcanic, or sedimentary?). 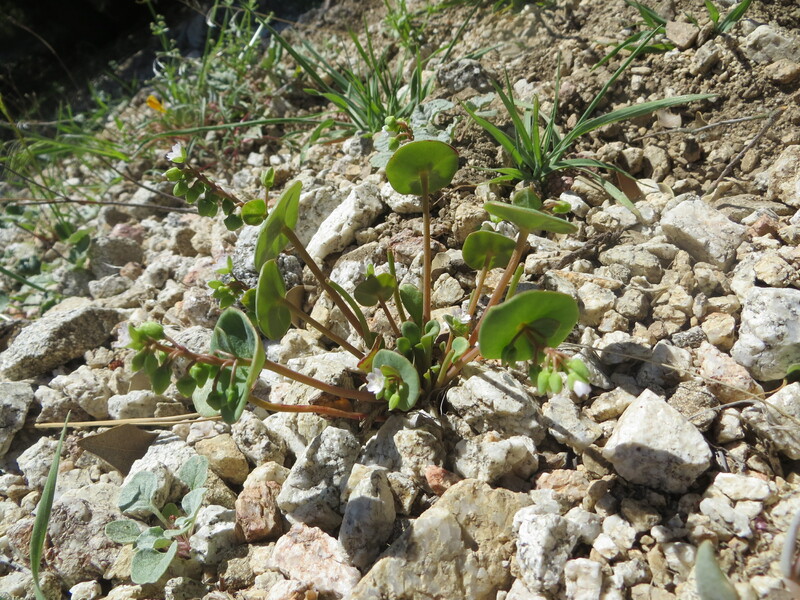 Crazy thing is, this Claytonia umbellata population consists of only a few plants scattered about in the cracks of the vertically oriented rocks (presumably oriented as such due to frost heaving) — they don’t seem to occur with the other rocks oriented horizontally. 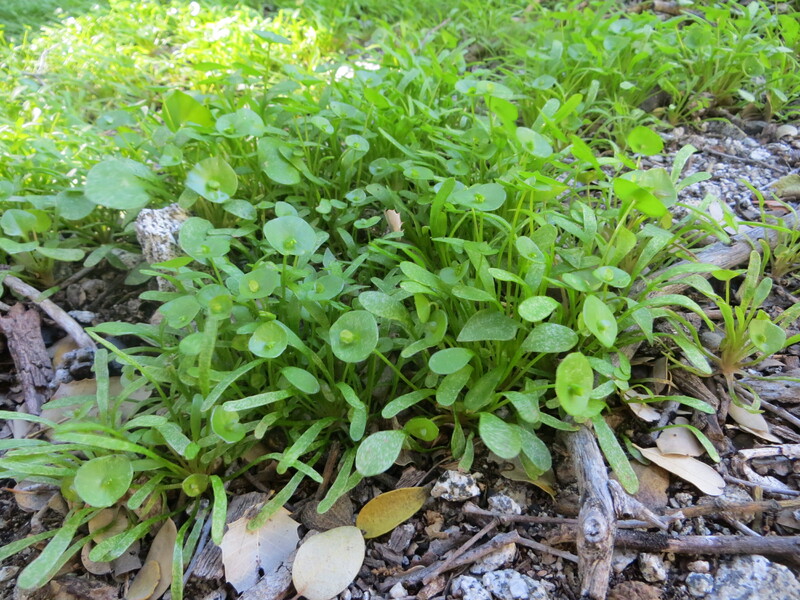 NOPE, it’s not Claytonia time here, at least not really anymore. 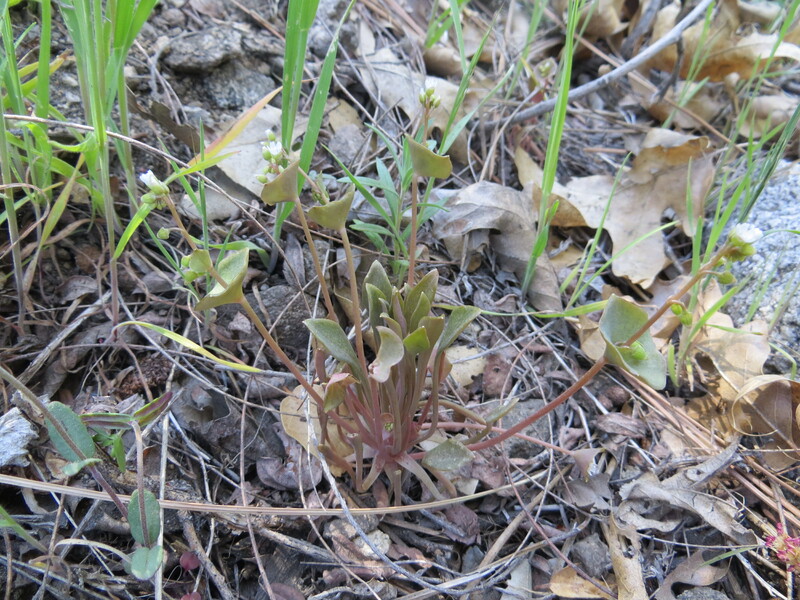 There were some plants around with buds, but most of the C. lanceolata var. 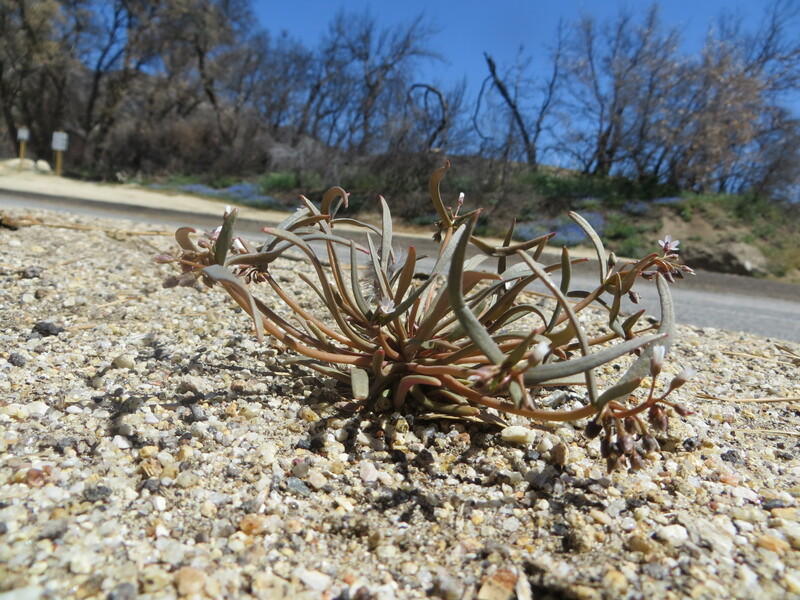 peirsonii here has dispersed its seeds and are beginning to wither back to their underground tubers. 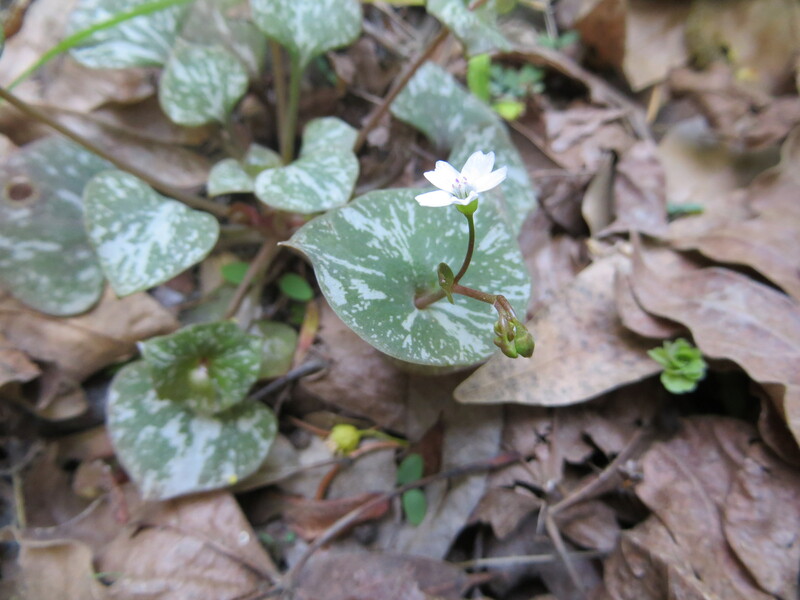 We did not find any flowering — I guess the Doyles will have to come back again next year, or meet me somewhere northward in a few more weeks! 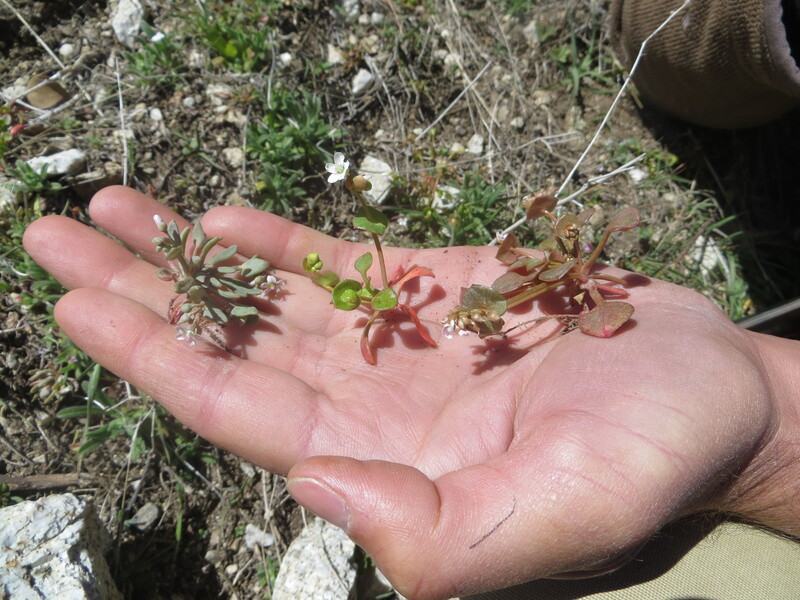 We did at least find some flowering Claytonia rubra there, just in the nick of time. It was time to send Jeff and Jane back to New York. 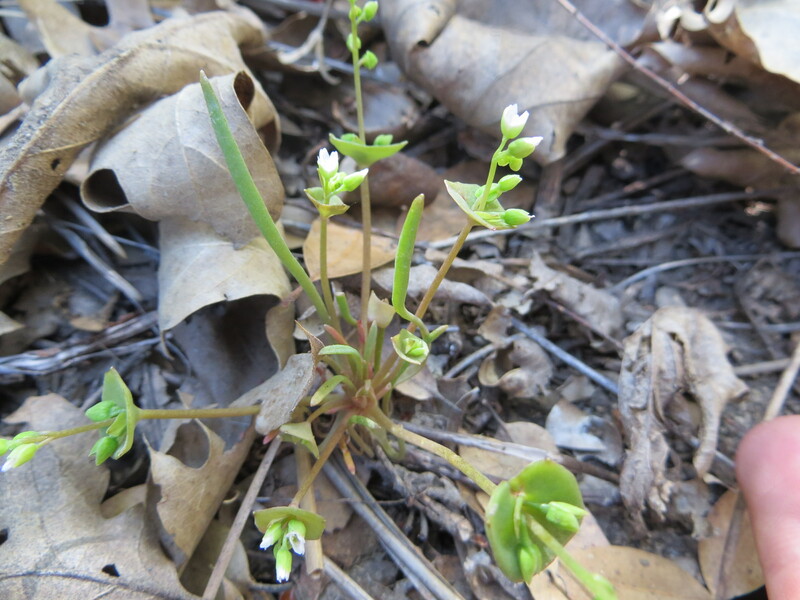 Although they may not have gotten to see (much) flowering Claytonia, at least they got to see some flowering California! 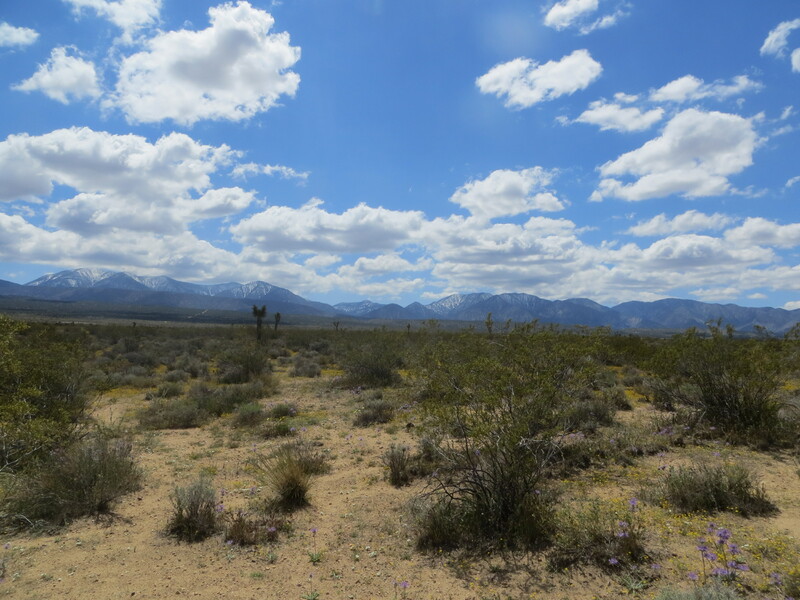 Spectacular wildflower bloom in the Mojave Desert near Piñon Hills, highway 138.